Origin: Found across all lower desert regions of southwestern North America from west Texas to California and into Mexico. Form & Character: Mostly evergreen shrub, straggly and open in dry soil, more dense and spreading when planted in wetter site, though under wet conditions can become excessively tall and ragged with age. Growth Habit: Slow to moderate to 3 to 15 feet, mostly 3 to 8 feet. Growth rate greatly increased if plant is able to access consistent source of water. Foliage/texture: Small to 1/2 inch, very viscid leaves divided into two crescents (bifoliate), very aromatic when wet (the smell of the desert), stems ringed with corky residue of former leaf stipules; fine texture. Flowers & fruits: Small yellow flowers followed by rounded fruit covered with white hairs that facilitate wind dispersal. Seasonal color: Yellow flowers in spring, occasional sporadic blooms in fall after summer rains. Soil: Tolerant, but well drained. 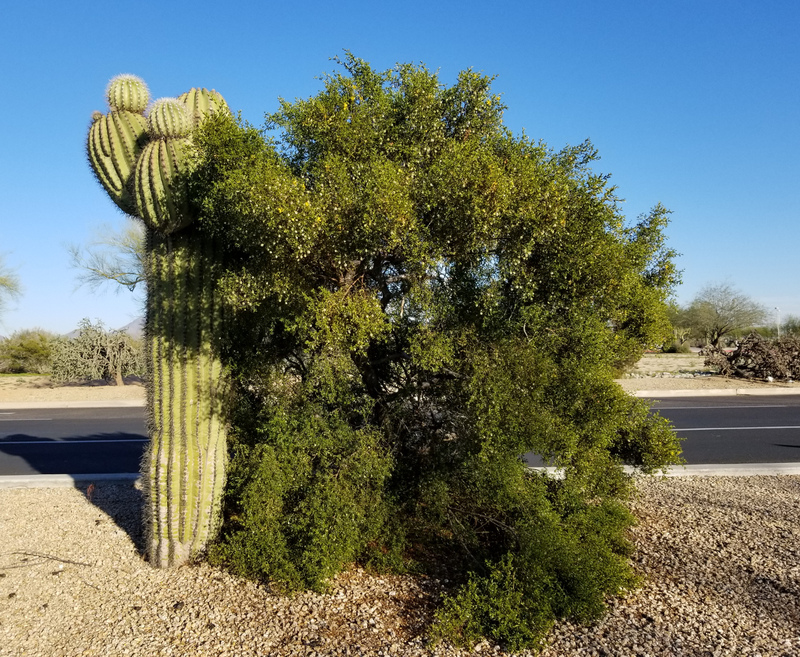 Watering: Creosote bush grows rapidly and becomes very large and gangly if given supplemental irrigation....so don't! Its use in the landscape in a sustainable fashion means to NOT water it. Though one may want to give it a "big drink of water" on rare occassions, it will grow slower and will ultimately maintain a more compact dense shape if not regularly irrigated. Pruning: Trained horticulturists will lightly head back creosote bush to encourage a more rounded, yet still natural looking habit of growth. 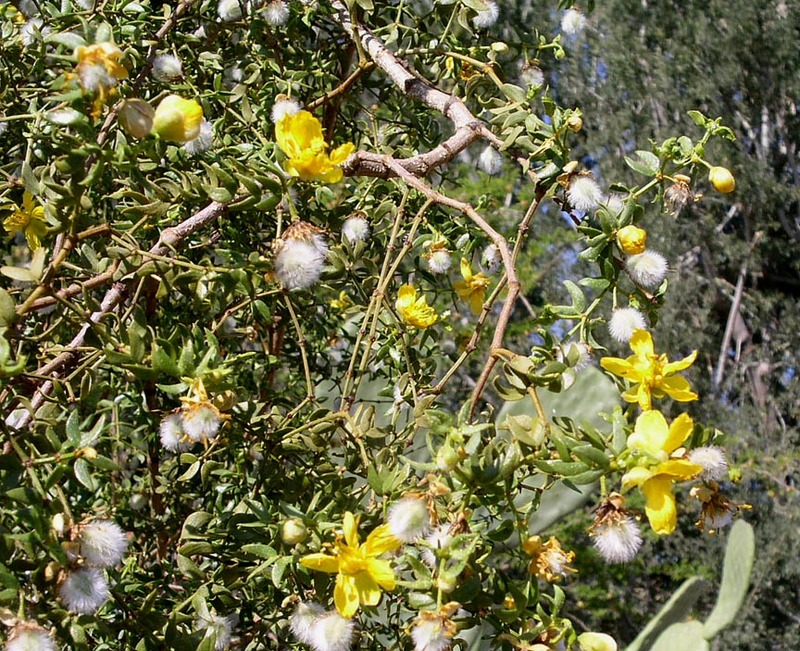 Creosote bush can also be rarely severely pruned to near ground level to rejuvenate vigor. More traditional 'red neck' (two bit haircuts for all) horticulturists will frequently shear creosote bush so as to make it look like and conform to the quintessential Phoenix 'beer keg' plant form. 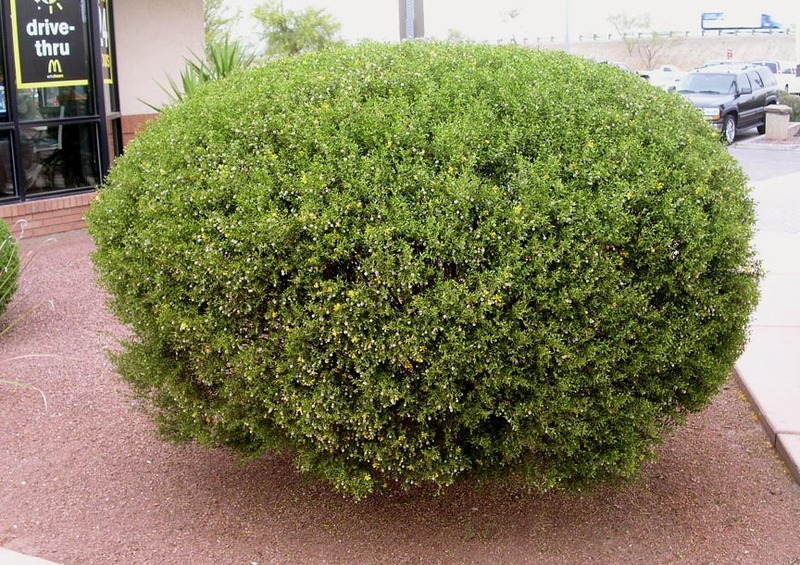 And you know what, creosote bush actually looks mod with a que ball look. Additional comments: Creosote bush is a plant of legend: the desert smells like creosote bush after most rains. Allopathic oils from creosote bush leach into surrounding soils and inhibit mitochondrial oxidation of embryo sugars inhibiting seed germination. 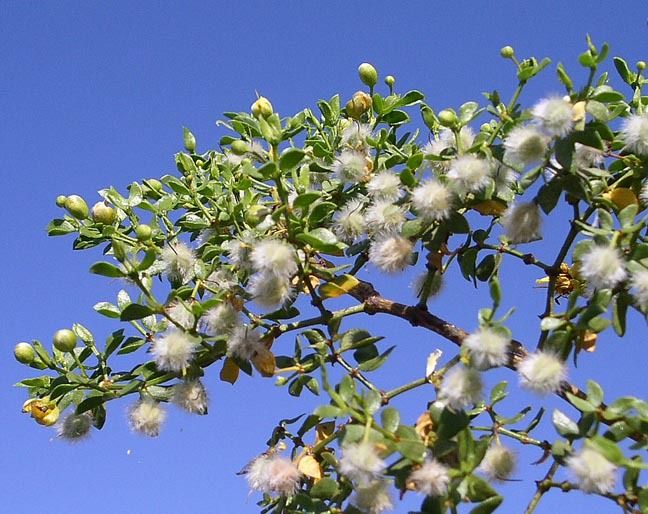 Anti-microbial properties make creosote oils useful as an ointment for skin abrasions and injuries. Within native desert stands called "creosote flats", single creosote plants may reach one thousand years old and form large rings of seemingly many plants. The genus name Larrea comes from the Spanish clergyman, Bishop Juan Antonio Hernandez Perez de Larrea (1731-1803).